Cost to paint trim varies greatly by region (and even by zip code). Get free estimates from painters in your city. Cost to paint trim varies greatly by region (and even by zip code). Get free estimates from painters in your city. The average cost of painting trim is $500 - $1,000​. How much does it cost to paint trim? 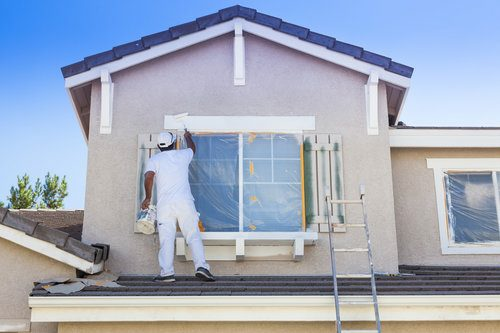 Painting your house's exterior trim can not only give the home a fresh update, but also alert you to any structural issues with the siding or trim. Painting the trim yourself is possible, but because of the time and skill required, hiring a professional is recommended. The price for painting exterior trim varies widely based on the style and amount of trim, but an average cost is $1 per linear foot, meaning a 1500 square foot home with 500 linear feet of trim will cost around $500. Materials: Most professional painters recommend using a primer 1 and two coats of paint on exterior trim. The paint typically costs $200-$500 depending on brand, quality; this should provide enough paint for a standard 1,500 square foot home. Other materials include brushes, tape, and scaffolding 2. 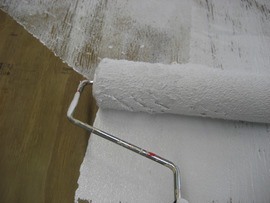 Most professional painters already have the remaining supplies and don't include them in the price. Labor: The majority of your painting budget will go to labor costs. Most professional painters earn an average of $20-$35 per hour, but you'll likely be paying for a team of painters instead of a single person. A 1,500 square foot house should take one to three days to prep and paint for one to two painters. Removal and disposal: If some of the trim needs to be patched or replaced, you'll have to pay for it to be removed and thrown away, which normally includes a base of the average labor cost of $15 an hour, plus a premium and any charges to use the landfill. Expect to spend around $200 to have trim removed. Extra features to your home, such as porches, doors, and shutters, can increase curb appeal and property value, but they come at a cost. Depending on the size of the porch, the cost can increase by $200-$500. Painting the trim around shutters averages around $50 per piece, and doors are typically around $75 each because they involved more paint and detail than painting simple trim. Using multiple colors, even for small accent colors, can add up to an extra $1 per foot to the total, depending on the number of colors and the area they cover. Unforeseen issues can arise, such as the discovery of water damage or cracked stucco 3, or rusty nails. The cost to fix these problems varies based on the magnitude, but expect to spend a larger chunk of change if there are structural issues. Homes with unique architectural features, such as mismatched or large windows, long or steep roof lines, or very large amounts of trim, typically have higher costs because of the labor and skill required. Even if it is good condition, trim that is dirty or covered in mildew will typically require an additional day to clean and prep, which will increase your labor costs by around $100. Homes built before 1978 may still have lead 4 paint on the trim. If this is the case, the painter will need to scrape and remove the paint. This job can be toxic, so it should only be done by a professional. Many professional painters will discount their services if you have your siding and trim painted at the same time. Depending on the contractor, discounts can be up to 30%. How much does it cost to paint trim in my city? Cost to paint trim varies greatly by region (and even by zip code). To get free estimates from local contractors, please indicate yours. We have added an image of the project, and a summary at the beginning with the cost of painting trim to help the user better understand the project, and an index to take you directly to any part of the guide. Cost Considerations: Depending on the brand used, a gallon of primer runs between $9 and $25. On average, a five gallon bucket of high quality primer costs between $70 to $110. A temporary structure used during construction/maintenance/painting projects to raise and support workers (or one worker), required materials, and equipment. 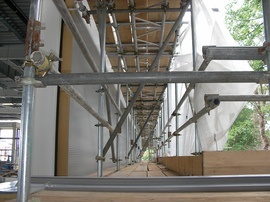 Cost Considerations: Professionals typically have their own scaffolding. For DIY projects, scaffolding may be rented for $15 to $50 a day or $40 to $150 a week. These costs depend on the size/type of scaffolding as well as your geographical location. 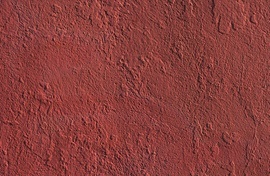 A type of durable plaster finish made of aggregates, a binder, and water (traditionally Portland cement, sand, and water) used on masonry, walls, ceilings, and decorative moldings. Cost Considerations: At $6 to $9 per square foot, stucco siding is much more costly than other types of siding, including cement fiber and vinyl siding. Professional installation generally costs between $40 to $50 per hour and takes three to five days per 1,000 square feet. 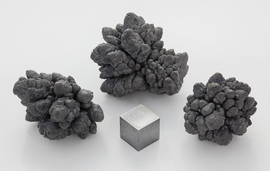 A naturally occurring heavy metal that is highly toxic to humans, and has been used in paint, gasoline, piping, and other applications. Cost Considerations: The average cost for lead paint abatement ranges from $8 to $15 per sq. ft. Encapsulation is also an option, and is 80% cheaper, however encapsulation does not actually remove the lead paint, and it may eventually become exposed again.